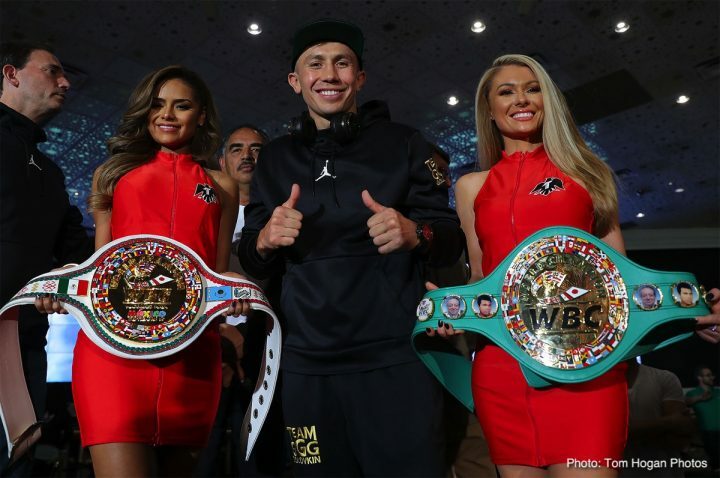 By Sean Jones: Gennady Golovkin’s current contract with HBO will be ending with his second fight against Saul Canelo Alvarez on Saturday night. Golovkin has fought on HBO 14 times since signing with the network many years ago. It remains to be seen if Golovkin (38-0-1, 34 KOs) will be re-signing with the huge network giant or not. Golovkin has been with HBO for the last six years, and they’ve helped him become a star in boxing. However, it’s unclear how committed HBO is to boxing. GGG has been with HBO since 2012 when he beat Grzegorz Proksa by a 5th round knockout. Losing GGG would take away a lot from HBO’s Boxing telecasts. They would still have Canelo Alvarez, but his future outlook isn’t that good unless his promoters at Golden Boy Promotions continue to feed him beatable fighters like they’ve been doing in matching him against over-the-hill fighters like Julio Cesar Chavez Jr., Amir Khan, Alfredo Angulo and James Kirkland. The boxing public isn’t going to be interested in seeing HBO televise Canelo’s fights against marginal middleweights like David Lemieux and Gary ‘Spike’ O’Sullivan. If Canelo isn’t going to face the better middleweights after his match against Golovkin on Saturday, then his popularity will likely diminish no matter which network he fights on. Many of the top middleweights in the division are fighting on Premier Boxing Champions on Showtime and Fox and on ESPN. Unless Golovkin is going to continue fighting Canelo in the future, it’s debatable whether he should re-sign with HBO for another three to four fights or not. Daniel Jacobs is with HBO. Whether Jacobs stays with HBO in the future is unknown. His promoter Eddie Hearn of Matchroom Boxing USA has a deal with DAZN to stream fights in the U.S. I won’t be surprising to see Jacobs having his future fights streamed on DAZN once his existing contract with HBO runs out. When Canelo tested positive for the banned substance clenbuterol earlier this year and then pulled out of his May 5 rematch on three weeks’ notice against GGG, the Kazakhstan fighter wound up facing Vanes Martiroysan. Golovkin received a $1 million guarantee by HBO. That’s considerably less than the $20 million that GGG will be getting for his rematch with Canelo on Saturday night. Just how much Golovkin would have made for fighting Martirosyan on another network like ESPN or on Showtime or Fox is unknown. Golovkin-Martirosyan likely would have given GGG a lot more money if the fight had been televised or streamed on pay-per-view. HBO put the fight on non-PPV. “We would’ve liked a bigger license fee,” GGG’s promoter Tom Loeffler said to the latimes.com. Loeffler believes that GGG has a lot of options available to him for important fights if he beats Canelo on Saturday. What’s unclear is whether those fights would be on HBO or not. Next to a third fight with Canelo, Golovkin’s likely best chance for a big payday would be for him to fight World Boxing Association ‘regular’ middleweight champion Ryota Murata. However, the Top Rank promoted Murata fights on ESPN, so a fight between him and Golovkin might not be possible unless the two of them were fighting on the same network. Interim WBC middleweight champion Jermall Charlo is with Premier Boxing Champions. Golovkin could make good money fighting Charlo, his brother Jermell Charlo as well as Jarrett Hurd.